In case you’ve been hiding under a rock that has blocked your view of what everyone and their mother (literally) are wearing on their feet this spring and summer, let me introduce you… or reintroduce you, as the case may be. For some of you, Birks are new. For many of you, Birks have been in your closet for years and your favorite pair is either getting bumped up into your current shoe rotation more these days, or you’re rocking them with pride, just like you always have. While I don’t currently own any Birkenstocks, they’ve been in and out of my own shoe closet since I was a teenager. You know, back when I was wearing perfectly ripped in all the right spots vintage, thrifted Levis and the comfiest tee I could find in my dad’s closet. Which is pretty much the same style I’ve been wearing lately. I suppose the ’90s are back after all, aren’t they? I’ve had my eye on a few pair of Birkenstocks from the selection at OnlineShoes.com to get me through a busy summer with the kids and these are my finalists. What do you think? 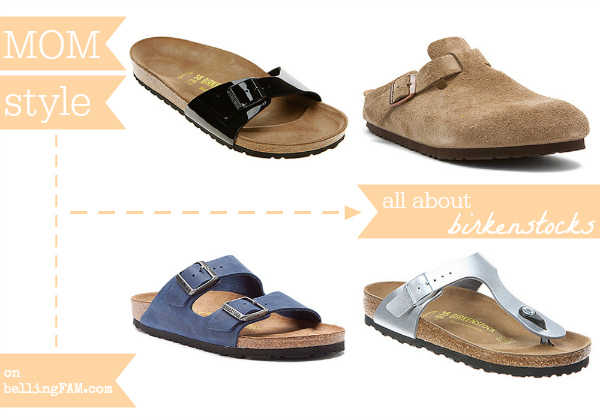 Do you own a pair of Birks? Which pair are your faves? Let’s vote on it, shall we? This entry was posted in Fashion & Style, Mom Style and tagged Birkenstocks, Mom Style, OnlineShoes.com, Shoes for Moms on May 30, 2014 by Katie Kavulla. I think I’m longing for a pair of Boston’s most, Stacee! With rolled up jeans? Perfect all year round in Bellingham, right? I’m leaning towards the black patent, too, Breanne. I think they look cute and are a little more my style, compared to the silver pair. And, they’re a good price, too!